I just sold this one. I kind of wanted to keep it because I like purple. I can always make another one. 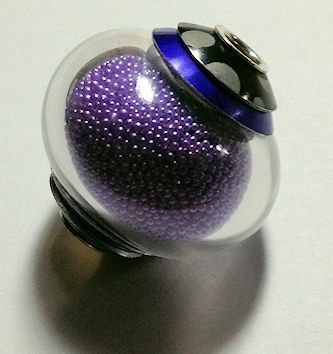 It’s a clear hollow bead with lilac microbeads filling it. The bead caps are anodized aluminum and it’s cored with sterling silver tubing. The blue looking bead cap is really more purple. I couldn’t get a good photo.